So Northern California hasn’t been quite as blazing hot as the rest of the country, ok to be honest, here in the Bay Area it has hardly been hot at all….BUT…I was still craving a summer dish to serve at an impromptu brunch for my family from out of town. Saw some gorgeous quartered watermelon pieces at Whole Foods and was inspired to serve a summer favorite, Arugula, Watermelon and Feta Salad. 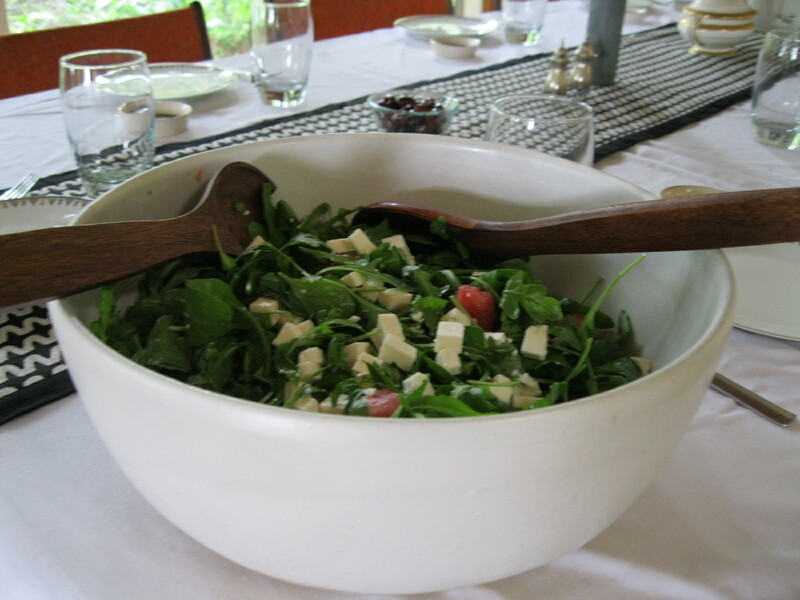 Sometimes I just serve the watermelon, mint and feta version but since I knew I had 8 or so people coming I wanted to bulk the salad up with arugula. It was a hit and most of my aunt’s and uncles had never tried the lovely combination of slightly salty feta and sweet watermelon. (I often use less than the full amount of dressing but this depends on your taste, extra dressing can be refrigerated for upto 3 days).